Merchant Taylors > News > Alumni News > Here’s to You Mrs Robinson! Here’s to You Mrs Robinson! 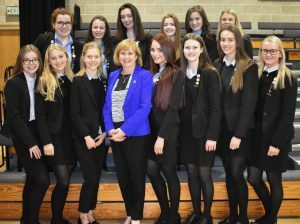 It has been a celebratory week for school as we have said goodbye to Mrs Louise Robinson after her twelve years in post as Headmistress. 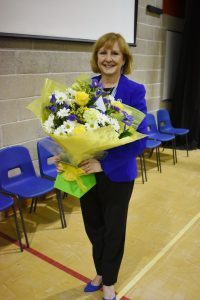 On Monday, Louise said her goodbyes in her last assembly to the school and the staff held their end of term tea party where it is customary to give leaving staff a sendoff, with gifts and speeches. Miss Yardley and Miss Tyndall spoke warmly of Mrs Robinson and she shared some poignant thoughts and funny anecdotes in response. On Wednesday, the girls spoke in assembly of the many things they have valued during their time as “Robinson” girls’. Thursday evening saw the Spring Concert given to honour the Head, including as it did, readings and pieces of music special to Mrs Robinson. Louise herself said: “I have some wonderful memories of the School: the many concerts and music competitions; joint productions and the Drama Festival; visits to Sierra Leone, events like the 100 years CCF celebrations and the Merchant Taylors’ Company dinners; Old Girls’ Association lunches as well as Old Boys’ dinners; Christmas shows and Nativity Plays; Duke of Edinburgh walks; sports’ days and swimming galas; as well as the weekly assemblies, School lunches and regular staff meetings. All of these form the backbone of the structure of the school, but it is the girls and their achievements I will remember with pleasure and pride. I will never forget the group of Upper Sixth students who sang their version of ‘Reach for the Stars’ to celebrate our ‘Reaching for Success’ statue in their tribute to their time in the School. Today, as her last formal duty in post, Mrs Robinson oversaw the handover from the current Head Girl Team to the new and received a gift from the girls during the Easter Assembly. This afternoon was the final goodbye at the end of the day, as Mrs Robinson stood for one last time at the main door, wishing everyone a Happy Easter Holiday. We hope you will join us in wishing Mrs Robinson all the best in her new ventures. There have been some tears of happiness through these events; but now is the time to say, one last time: Good bye and good luck Louise!